The Book of Gabriel - Archangel of the Moon. 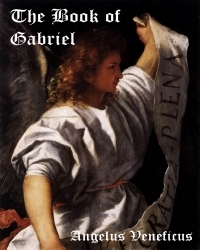 The Book of Gabriel is unique as it introduces to the reader or student the magick of this archangel. A short history forms an introduction, then what follows is the practical Kabbala of the Archangel, which concerns itself with the various method of communicating with the Archangel Gabriel. The importance of the Moon, not only as a means of contacting Gabriel, but also in the practice of the Pauline Art. We discuss the magical script of Gabriel, inks, perfumes and incense for those who wish to make their own. The Invoking talisman of Gabriel, The Secret Seal of Gabriel, Gabriel's signs and symbols are all described. The reader is also introduced to the Olympic Spirit of the Moon, appropriate talismans and meditative exercise suitable for angelic contact to the Archangel Gabriel of the Moon. This unique Book may also form part of a complete Angelic Grimoire if you wish, by combining other archangel eBooks. This is not a re-hash of other eBooks but a serious compilation of traditional information from an experience practitioner and builds into a formable tome of angelic information. Due to the success of the first edition, The Book of Gabriel has been reviewed and where necessary corrected and concepts clarified. I have also added new Archangel and Moon Talismans and their applicability to the Pauline Art. These include Talismans from the Armadel, Picatrix, Ars Paulina (The Lesser Key of Solomon) , and Liber Lunae orThe Book of the Moon. This second review has aligned The Book of Gabriel with The Grimoire of the Archangels. In order to add power to your rituals I have also added a number of Mystical Hymns of Orpheus from my book, "Hymns for the Archangels". which may be used for mediation and invocation. As always this eBook is to be used, not read. It is not an academic review of the Pauline Art, it is a practical workbook, and therefore you are actively encouraged to put into practice the rituals and spell described. I do hope that the information compiled is useful in your quest for angelic communication and assistance. Copyright © 2019 - Archan - The Publisher. All Rights Reserved.